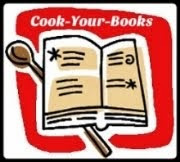 This recipe is from one of the cookbooks I borrowed from the library. 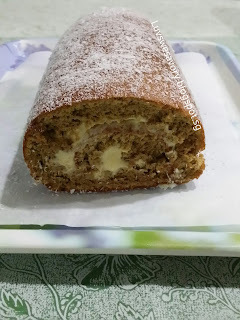 When I read the ingredients, I know I'm so going to bake this allspice pungent and fragrant with a hint of coconut aroma and delicious honey cream ... all in one swiss roll. Recipe adapted from cookbook The Baker Leanne Kitchen. Below my slightly modified version as I've left with some "soon to be expired" cream cheese in the fridge, added to the honey cream, and my notes in blue. (I adjusted the oven temperature 190°C. Position the rack in the middle.The temperature of the oven may vary, do adjust accordingly). 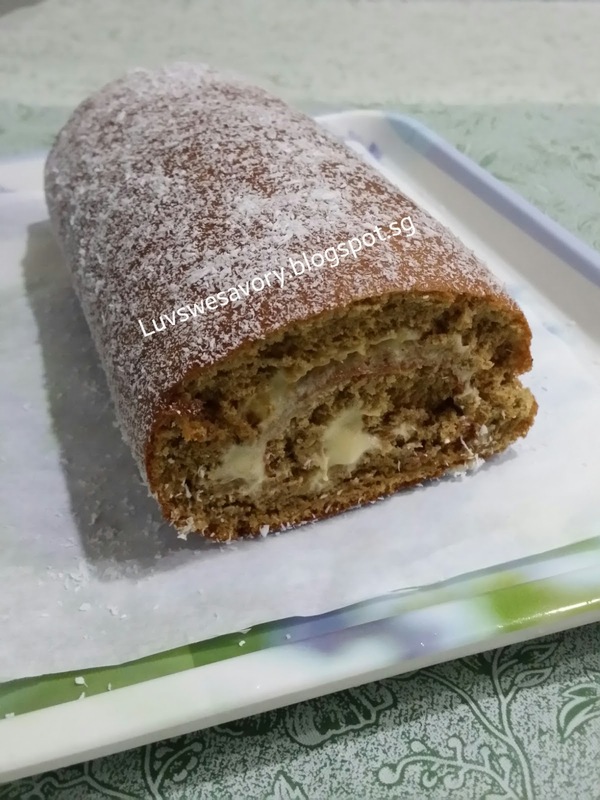 Grease a 30cm × 25cm (12 × 10 inch) swiss roll pan (jelly roll pan). Line the base with parchment paper, leaving the paper hanging over two opposite sides. Sift the flour together with allspice powder 3 times. In a clean mixing bowl, whisk the eggs with an electric mixer till thick and pale for about 5 minutes in medium - high speed. Gradually add in the soft brown sugar in 3 separate additions. Beating constantly until the sugar has dissolved and the mixture is pale and glossy. Gently fold in the sifted flour with a spatula until just combined and smooth texture. Pour the batter into the prepared pan, level the top with spatula. Gently tap the pan a few times on table top to release the trapped bubbles in the batter. Bake in the oven for about 12 minutes or the top is evenly lightly golden and springy to touch. Using an electric mixer, beat the butter and sugar till fluffy and creamy (about 4 minutes). Next, add the cream cheese and honey, continue beating for another 2 minutes or until light and fluffy. Set aside. Remove the cake from the oven and leave to cool in the pan for 1 minute. Turn the cake (skin side) onto a clean sheet of parchment paper sprinkled with dessicated coconut and leave for 1 minute. Peel off the lining paper. Spread the honey cream over cake leaving about 1/2-inch border all around. This is to prevent the excess cream oozes out when rolling the cake. Gently but firmly roll the cake up into a Swiss roll. Trim the ends using a sharp knife. Refrigerate the roll in an airtight container. Cut into slices just before serving. I trimmed both the ends and asked my big boy to try. He could tell the difference that this honey swiss roll is so different from the previous swiss rolls I've baked. 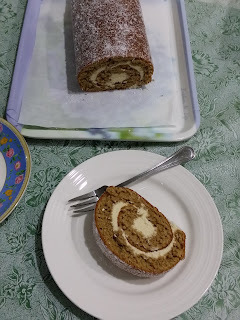 He loved it and commented the fragrant and honey cream tasted so good. Spongy cake texture spreaded with honey cream beneath the crisp springy roll skin covered with crisp dessicated coconut. Love the wonderful aroma ... Enjoy our brekkie on a cool rainy Sunday morning. Karen, I think your addition of cream cheese makes this Honey Roll even better! How nice if I can have a piece of your swiss roll because looking at your swiss roll makes me hungry. Just nice for tea-time! I guess I would ask for a 2nd piece..... sponge cake one of my favourite; never get enough. 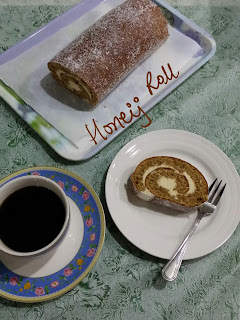 Hi Karen, this honey roll must be very fragrant with the all spice powder. 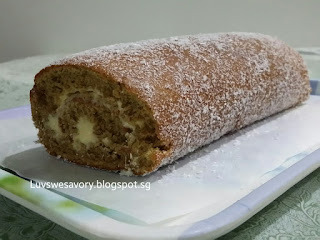 I remembered my neighbour gave me some All Spice Powder she bought in S'pore, it is very aromatic when used in cakes. I must try to find it when I visit S'pore in the near future. Not sure if this one is available at Phoon Huat? I bought McCormick brand. Phoon Huat carries a few brands too. I'm sure you can find it there. the spice reminds me of a gingercake... and cream cheese...this is yummy! Wow, your swiss roll is rolled so perfectly! Looks fabulous! With the fragrance from the spice and sweetness from the honey, one slice is not enough!